Old negatives and slides are the most overlooked, if not ignored treasures in family archives. However they can be a great source of information and joy. Yet, there are some safety considerations to be aware of with old negatives. A must-read for owners of negatives & slides. Learn the dangers and access videos from the book! Videos include original footage of burn tests on vintage (nitrate) film, safety film from the 1950s, and modern 35mm negatives. 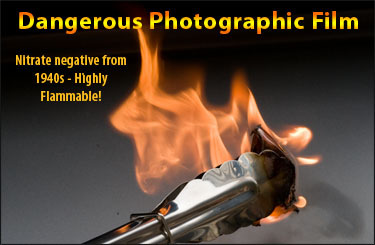 Most pre-1950 film negatives have the potential to be hazardous, including the ability to spontaneously catch fire. Learn how to identify these potentially dangerous negatives. Storage and disposal guidelines are also provided to ensure a safe collection. We did the tests so you don't have to. Some breathtaking video illustrate the potential hazards. This subject is not one to ignore. Early negatives included sizes not found today, and some are not accepted by printing services. Learn which formats you have and how to scan them. We show you how to clean and archive your film. The most illustrated work on the subject. High quality images for step-by-step guidance. 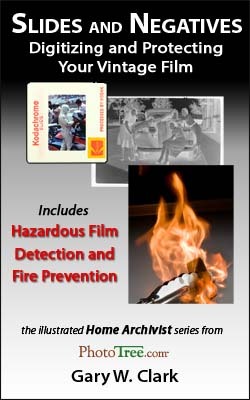 Video links illustrate hazardous film examples.